Abelia grandiflora is an old fashioned favourite, a shrub grown for its unusual foliage, exuberant flowers (clusters of fragrant and svelte pink and white tubular flowers are common), dependable performance and easy care. Its robustness and tall mature height (after 10 to 20 years) also makes it ideal as a privacy hedge if you’re not in a hurry! The plant's name commemorates Dr Clarke-Abel, surgeon to the well-documented Amherst mission to China in the early 1800s. 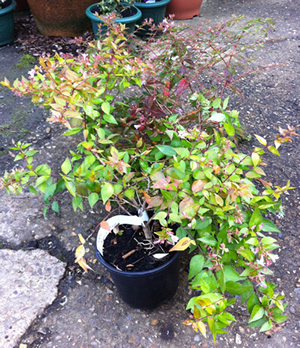 It comes in a range of colours and forms; for instance, the evergreen abelia sports red foliage all through the summer months, with the shade of red taking on a deeper and more spectacular appearance in autumn and winter. These plants can reach a height of four to six feet (120cm to 1.8m) and a spread of three to five feet (90cm to 150cm). Plants can be deciduous, semi-evergreen (the glossy abelia plant is considered semi-evergreen, as it may shed half its leaves in cold winters) or evergreen – these factors will vary according to the climatic conditions. Hardiness is between zones seven and nine. It is best planted against a wall for extra warmth. Flowers are smallish and tubular, pale pink and borne from late summer to mid-autumn. This plant is simple enough for beginners to experiment with, but not fully hardy; it calls for a fairly sheltered position. When planting, select a spot that gets full to partial sun. The glossy abelia plant grows in a range of soil types, but responds best to a fertile soil amended with organic material - abelia grandiflora prefers dry-ish, slightly alkaline soil. In late spring, prune the plant to remove dead wood. Propagate by taking soft wood cuttings in summer or semi-hardwood cuttings at the end of the season. Regular watering may enhance performance, but don’t over-do it! When growing the standard Abelia grandiflora, leave room for the plant to spread to six feet and reach six to 10 feet in height. After all, it’s an expansive plant – you need to respect its need for space. Newer varieties are more compact and need less pruning; overall, abelia care is not particularly time consuming. When it comes to maintenance, this plant is generally pest and disease free. It may need hard pruning every three to four years, which places it in Pruning Group Eight, according to the RHS. When the bush matures, it is important to trim it back, so that it does not become too obese.